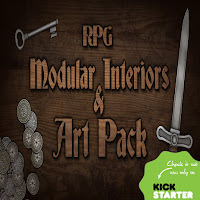 I don't recommend too many Kickstarters (or at least I don't think I do), but Fantasy Maps, Floorplans & Art Pack for RPG games is one I just signed on to. The creator, Jean Francois Senay, has done five previous Kickstarters and usually has most of the artwork completed before he even launches. For about $9 USD you can pick up some new modular interior floorplans (nothing too special there) , nine furnished rooms, and 135 items. I bought in for the finished rooms & items, which I think are great resources when playing online with the likes of MapTools or Roll20.